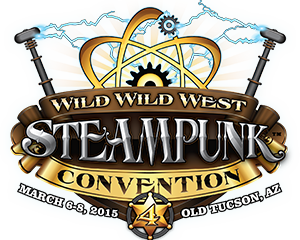 Are you looking for just the right character to assume for the Wild Wild West Steampunk Convention? Check out the costume ideas below for some convention-worthy Wild West Steampunk personas. Do you like the idea of cashing in by bringing down the criminals on wanted posters? Yes! Then you might be just right to dress as a bounty hunter. Dress in inconspicuous desert browns and tans. Wear leather boots, carry a big steampunk weapon, but keep it partially concealed under a Mexican poncho. 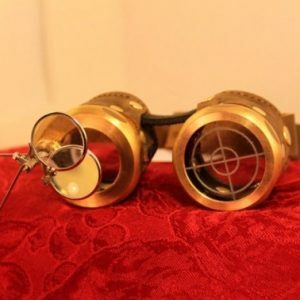 The Sherlock Holmes goggles with targeting eyepiece will help you get the job done. 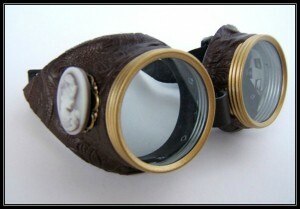 Keep a close eye on your target in these Sherlock Holmes goggles. If you are saving up money to go adventuring, perhaps you want a job serving drinks and dancing at the town saloon. Wear a brightly-colored dress, preferably with a thickly ruffled can-can skirt. Drape your shoulders with an oriental silk scarf. 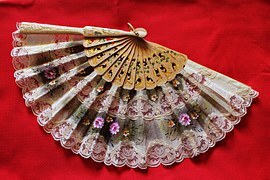 Tuck a lace folding fan into your hip pack next to your steampunk deringer. You’ve been engineered to make the “wild” west a little less unruly. Wear a “boss-of-the-plains” cowboy hat and carry a western-looking revolver-style blaster to enforce the law. Choose a long-sleeved white shirt and a leather vest with some brown or tan pants. The more metal you can add to your costume the better, including a sheriff’s star pinned to your vest and a set of spurs. Choose at least one body part to be mechanical—use gears and other machine pieces on a glove to simulate a robotic hand, or wear a monocle with green lens. Forget the Pony Express, they’ve got nothing on your steam-powered delivery business. As an innovative woman forging her own way in the rough wild west you dress with utility in mind. Wear an old civil-war style kepi cap and a pair of Cameo goggles. A white blouse and leather corset over either a brown skirt or slacks. Wear leather boots and carry a messenger bag and an assortment of other hip packs or clip–on pouches to carry all the parcels you are delivering. Don’t forget a weapon to protect the valuable packages of your customers. Steam is king and you’re the one bringing it to the wild west. Your confident manner will be just as important as how you dress to be convincing as a successful steampunk business man. Wear a black suit with a vest of a contrasting rich color such as rust red and a fob pocket-watch hanging out the front. Choose a coordinating silk cravat for around your neck and either a gear-shaped lapel pin, or a leather flower tucked in the buttonhole. A top hat is the ultimate status symbol of your success. A fashionable walking stick also makes a great cover for a hidden weapon.